After 7 weeks, we have to say goodbye to one of our students as he is finished his English for Work course. Here is the testimonial of Eduardo Nunes, from Brazil, he finished his intensive English course in EC london 30+ last Friday. London was not my 1st option to learn English. I was looking for small/calm city to stay. But EC London 30+ concept sound to be a fantastic option. And it really was a surprise. EC London 30+ was exactly what I was looking for. The best teachers, classmates, staff, location… everything was perfect. I’ll recommend to my friends and I’ll be back! The extra activities were the best way to interact with other students and enjoy the city. Special thanks to: Georgia, Matt, Chris, Clare, John, Matthew, Adam and Sara!!! 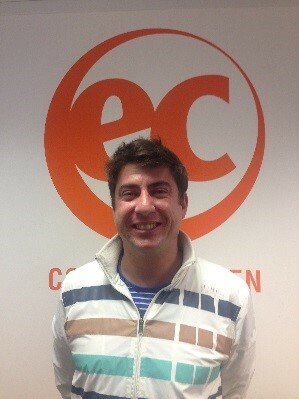 Thank you so much Eduardo from EC London 30+ team. We hope to see you soon 🙂 !! If you would like to practise your English online, try our Learn English website.